When asked to pick the top two most important issues for their vote this election cycle, Americans are more likely to point to the cost of health care than any other issue. Four in ten (40%) say that the cost of health care is either the first or second most important issue for them. About one-third (34%) say the same about the economy, while about one-quarter cite the growing gap between rich and poor (27%) and immigration (25%). Less than one in five cite gun policy (19%), national security (18%), or racial inequality (14%) while less than one in ten (7%) cite abortion. Just three percent of Americans say that lesbian, gay, bisexual, or transgender issues are either the first or second most important issue to them this election cycle. There are significant differences between partisans on which issues are most important for their voting decisions. 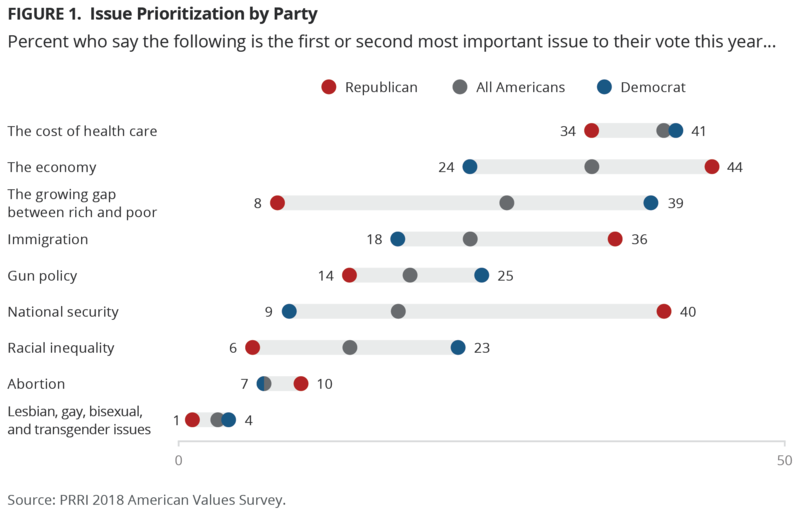 Democrats are more likely than Republicans to prioritize the cost of health care (41% vs. 34%), the growing gap between rich and poor (39% vs. 8%), gun policy (25% vs. 14%), and racial inequality (23% vs. 6%). By contrast, Republicans are more likely than Democrats to prioritize the economy (44% vs. 24%), national security (40% vs. 9%), and immigration (36% vs. 18%). Few Democrats or Republicans say abortion or lesbian, gay, bisexual, or transgender issues are the first or second most important issues for their vote this year. Men and women have similar issue priorities, with two exceptions. While men are more likely than women to prioritize the economy (39% vs. 30%), women are more likely than men to prioritize the cost of health care (44% vs. 35%). There are a few gender divides within the political parties. Among Republicans, men are more likely than women to prioritize the economy (49% vs. 39%), but less likely to prioritize the growing gap between rich and poor (6% vs. 11%). Among Democrats, women are somewhat more likely than men to prioritize abortion (9% vs. 3%). There are significant racial and ethnic divides on the importance of these issues. Hispanic Americans (40%) are more likely than both white (25%) and black (12%) Americans to prioritize immigration. While more than one in five (23%) white Americans say that national security is their first or second most important issue, only about one in ten (12%) Hispanic Americans and seven percent of black Americans similarly prioritize this issue. Nearly half (46%) of black Americans prioritize racial inequality as their first or second most important voting issue, compared to about one in five (18%) Hispanic Americans and seven percent of white Americans. More than half (54%) of Americans report that they are absolutely certain to vote in the midterms, while 19% say they will probably vote. About one-quarter (26%) put their odds of voting at 50-50 or less, including 8% who say they are definitely not voting. There are notable racial and ethnic differences on this question. Nearly six in ten black (58%) and white (57%) Americans say they are absolutely certain to vote, compared to only about four in ten (43%) Hispanic Americans. Among whites, those with a four-year college degree are significantly more likely than those without a degree to report they are certain to vote (71% vs. 49%). There are also gender differences within racial and ethnic groups. Notably, more than six in ten (62%) black women, compared to 52% of black men, say they are absolutely certain to vote. Hispanic men and women are about equally likely to say they will vote. Among white Americans, men are more likely than women to say they are absolutely certain to vote (63% vs. 51%). Seniors (ages 65 and older) are significantly more likely than young Americans (ages 18-29) to report that they intend to vote in the 2018 midterm elections. More than eight in ten (81%) seniors say they are absolutely certain to vote, compared to just 30% of young Americans. Partisans are about equally likely to report that they will vote. About six in ten Democrats (63%) and Republicans (59%) say they are absolutely certain to vote. While Democratic men and women are about as likely to say they will vote, Republican men are more likely than Republican women to say they are absolutely certain to vote (66% vs. 51%). A majority of Americans report that all or most of their close friends will be voting in the upcoming midterm elections. Six in ten say that all (11%) or most (49%) of their close friends will be voting. About four in ten (39%) Americans report that about half or less than half of their friends will turn out to vote, including three percent who say that none of their friends will vote. More than one in five (22%) black Americans, compared to just 10% of Hispanic Americans and nine percent of white Americans, report that all their friends will vote in the midterms. Hispanic Americans (45%) are more likely than white (38%) or black (34%) Americans to say that about half or less than half of their close friends will vote in the midterms. There are notable gender gaps among racial and ethnic groups. 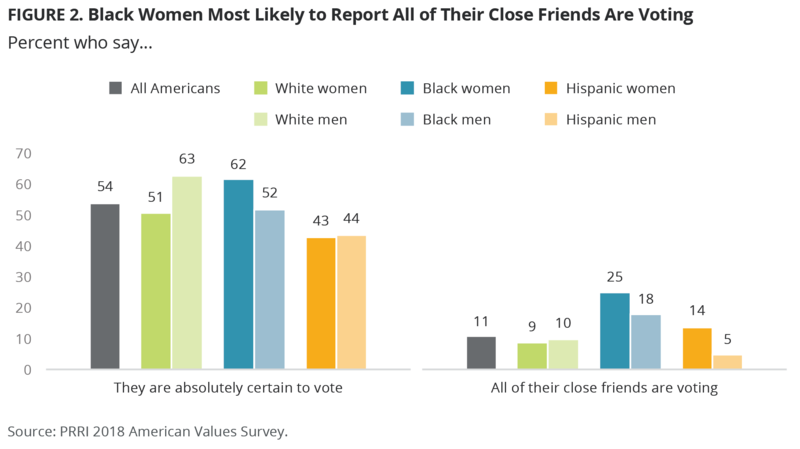 Black women and black men are both more likely than members of other racial or ethnic groups to say that all of their close friends will be voting in the midterm elections. Black women stand out in particular, because they are significantly more likely than either white or Hispanic women to report that all of their friends will be voting (25% vs. 9% and 14% respectively). Similarly, black men are more likely than either white or Hispanic men to report that all of their friends will be voting (18% vs. 10% and 5%, respectively). Democrats are more likely than Republicans to say that all their close friends will be voting in the midterms (15% vs. 9%). While there are no gender gaps among Republicans, Democratic women are more likely than Democratic men to say that all of their close friends will be voting (18% vs. 12%). Heading into November, Democratic candidates have a nine-point advantage over Republican candidates. Nearly half (48%) of registered voters say that they would choose the Democratic candidate on the ballot if the election were held today, while about four in ten (39%) say they would vote for the Republican. There is a significant gender gap when it comes to candidate preference. Women (57%) are more likely than men (39%) to say they would vote for a Democrat if the election were held today. Conversely, men are more likely than women to support the Republican candidate (48% vs. 31%). Among those who prefer the Democratic candidate in the 2018 election, roughly equal numbers say they are doing it to advance the issues they care about (49%) or that they are doing it to oppose Trump and his agenda (48%). Just two percent say they are voting this way to support Trump and his agenda. Similarly, those who prefer the Republican candidate in the 2018 election are as likely to say they are doing it to advance issues they care about (46%) as they are to say they’re doing it to support Trump and his agenda (46%). Notably, almost one in ten (7%) say they are voting for a Republican candidate in order to oppose Trump and his agenda. There are some notable demographic differences on this question among those who favor Republican candidates. Within this group, Americans with a four-year college degree are more likely than those without a degree to say their vote is about advancing issues they care about (55% vs. 42%) and less likely to say it is about supporting Trump (39% vs. 49%). Women who support a Republican are more likely than men to say that their vote is about opposing Trump and his agenda (11% vs. 3%). Young Americans who say they prefer the Republican candidate are also more likely than seniors to express this sentiment (18% vs. 2%). Six in ten (60%) Americans hold an unfavorable opinion of President Donald Trump, including nearly half (47%) who say their opinion is very unfavorable. Only 35% of Americans have a favorable opinion of Trump, including 14% who say their opinion is very favorable. More than eight in ten (82%) Republicans report having a favorable opinion of Trump, including over one-third (37%) who say they have a very favorable opinion of the president. By contrast, only 10% of Democrats view Trump favorably. Almost nine in ten (89%) Democrats have an unfavorable opinion of the president, including 79% who hold a very unfavorable view. More than six in ten (64%) political independents view the president unfavorably. With the unique exception of white evangelical Protestants, majorities of all other major religious groups have an unfavorable opinion of Trump. Majorities of black Protestants (80%), religiously unaffiliated Americans (75%), Hispanic Catholics (74%), non-Christian religious Americans (73%), white mainline Protestants (52%), and white Catholics (52%) have a negative opinion of Trump. By contrast, almost seven in ten (68%) white evangelical Protestants have a favorable view of Trump, including 28% who have a very favorable view. Americans generally view the Democratic Party more favorably than the Republican Party. While about half (48%) of Americans report a favorable view of the Democratic Party, just one-third (33%) have a favorable view of the Republican Party. About six in ten (61%) Americans have an unfavorable opinion of the Republican Party, compared to about half (46%) who view the Democratic Party unfavorably. The vast majority of Democrats (87%) and Republicans (82%) hold a favorable view of their own party, including about one-quarter who have a very favorable view of their own party (26% vs. 25%). Partisans feel about equally negative about the opposite party. Overwhelming majorities of Democrats (90%) and Republicans (87%) have an unfavorable opinion of the opposing party, including majorities who have a very unfavorable view of the other party (53% vs. 58%). 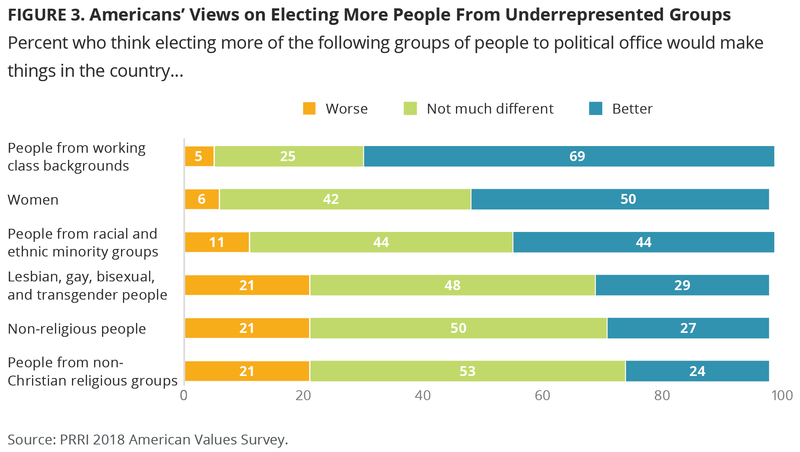 With one exception, relatively large numbers of Americans say that having more members of under-represented groups elected to public office would make no difference for the country. About half say that electing more people from non-Christian religious groups (53%), more non-religious people (50%), or more lesbian, gay, bisexual, and transgender people (48%) would not make much of a difference. About four in ten Americans also say that electing more people from racial and ethnic minority groups (44%) and women (42%) wouldn’t make much of a difference. By contrast, only one-quarter (25%) say that electing more people from working-class backgrounds would make no difference. Americans are more likely to say electing more people from the following backgrounds would make things better rather than worse: working-class (69% vs. 5%), women (50% vs. 6%), racial and ethnic minorities (44% vs. 11%), lesbian, gay, bisexual, and transgender people (29% vs. 21%), or non-religious people (27% vs. 21%). Americans are divided on the effect of electing more people from non-Christian religious groups (24% better vs. 21% worse). There are striking partisan differences on this issue. Democrats are more likely than Republicans to say that electing more people from the following backgrounds would make things in the country better: working-class (74% vs. 64%), women (72% vs. 26%), racial and ethnic minorities (61% vs. 22%), lesbian, gay, bisexual, and transgender people (44% vs. 9%), non-religious people (37% vs. 10%), or non-Christian religious groups (35% vs. 9%). Conversely, Republicans are more likely than Democrats to say that electing more individuals from under-represented groups would have a negative impact: lesbian, gay, bisexual, and transgender people (40% vs. 12%), non-Christian religious groups (40% vs. 16%), non-religious people (40% vs. 14%), people from racial and ethnic minority groups (18% vs. 7%), or women (9% vs. 4%). Americans are divided in their understandings of socialism. While a majority (54%) identify socialism as a system of government that provides citizens with health insurance, retirement support, and access to free higher education, about four in ten (43%) say socialism is a system where the government controls key parts of the economy, such as utilities, transportation, and communications industries. Democrats are more likely than Republicans to say socialism is about providing citizens with services (61% vs. 43%), while Republicans are more likely than Democrats to say it is about government control of industry (54% vs. 36%). Across a wide array of measures, a majority of Americans disapprove of the president and his conduct in office. Almost six in ten (58%) disapprove of Trump’s job performance as president. Nearly seven in ten say they would like his speech and behavior to be more consistent with his predecessors (69%) or that he has damaged the dignity of the presidency (69%). Nearly six in ten (59%) say he has not used his authority to pardon appropriately, and a majority (54%) believe that his decisions and behavior as president have encouraged white supremacist groups. Among Republicans, and independents who lean toward the Republican Party, one-third (33%) say they would prefer someone else as the Republican nominee in 2020. Support for Trump is nearly unchanged from one year earlier. With the 2018 midterms fast approaching, nearly six in ten (58%) Americans disapprove of Trump’s performance as president, including 42% who strongly disapprove. Just over four in ten (41%) Americans have a positive view of Trump’s job performance. A majority of Americans say there is nothing that President Trump could do to change their opinion of him. More than four in ten (46%) say they disapprove of Trump’s job performance and that there is nothing he could do to win their approval, while 14% say they approve of Trump and that there is nothing he could do to lose their approval. By contrast, four in ten Americans either approve (27%) or disapprove (13%) of the president but say that there is something he could do to change their mind. Among Democrats, almost eight in ten (78%) say they disapprove of the president and there is nothing he can do to win their approval, while 12% disapprove but say there is something he could do win their approval. By contrast, nearly four in ten (37%) Republicans say they approve of the president and that there is nothing he can do to lose their support. A slim majority (51%) of Republicans approve of Trump but say there is something he could do lose their approval. There are notable gender gaps among partisans. Democratic women are more likely than Democratic men to say they will never approve of Trump (82% vs. 72%). By contrast, Republican men are more likely than Republican women to say they will always approve of Trump (44% vs. 30%). There are deep divides between members of different religious traditions. Black Protestants (66%) are more likely than religiously unaffiliated Americans (58%), Hispanic Catholics (56%), white Catholics (39%), and white mainline Protestants (38%) to say they will never approve of Trump. Only 16% of white evangelical Protestants say the president cannot win their approval. Meanwhile, about one-quarter of white evangelical Protestants (25%) and white mainline Protestants (22%) say there is nothing Trump could do to lose their support, compared to 19% of white Catholics and 12% of Hispanic Catholics. Just six percent of black Protestants and four percent of religiously unaffiliated Americans say there is nothing Trump could do to lose their approval. By a margin of two to one, Republicans and independents who lean Republican say they want Donald Trump to be the nominee in 2020. About two-thirds (66%) of Republicans prefer Trump as the nominee. One-third (33%) say they would prefer someone else. There are notable demographic divides among Republicans on this question. Republican women are more likely than Republican men to say they would prefer an alternative Republican candidate in 2020 (38% vs. 28%). Similarly, young Republicans are more likely than seniors to say they want a different nominee (45% vs. 24%). Still, there is no major Republican subgroup in which a majority expresses a preference for a candidate other than Trump in 2020. A majority of Americans think that President Trump has marred the office of the president. Almost seven in ten (69%) say that he has damaged the dignity of the presidency, while three in ten (30%) disagree. There are striking partisan divides on this question. More than nine in ten (91%) Democrats, seven in ten (70%) independents, and nearly four in ten (37%) Republicans think that Trump has damaged the office of the presidency. There are no notable educational or gender divides between co-partisans. Even among Americans who approve of Trump’s job performance, 31% believe he has damaged the dignity of the presidency. With the exception of white evangelical Protestants, strong majorities of every major religious group believe that Donald Trump has damaged the dignity of the presidency. 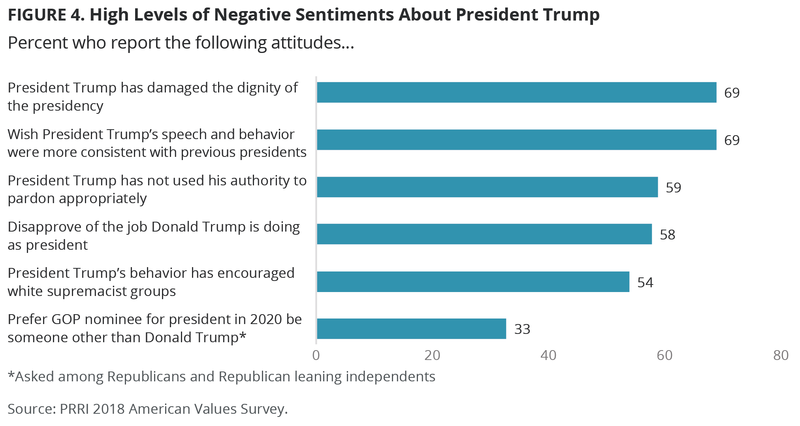 More than three-quarters (77%) of religiously unaffiliated Americans and about two-thirds of white mainline Protestants (68%) and Catholics (67%) agree that President Trump has damaged the dignity of the presidency. This view is shared by less than half (47%) of white evangelical Protestants. 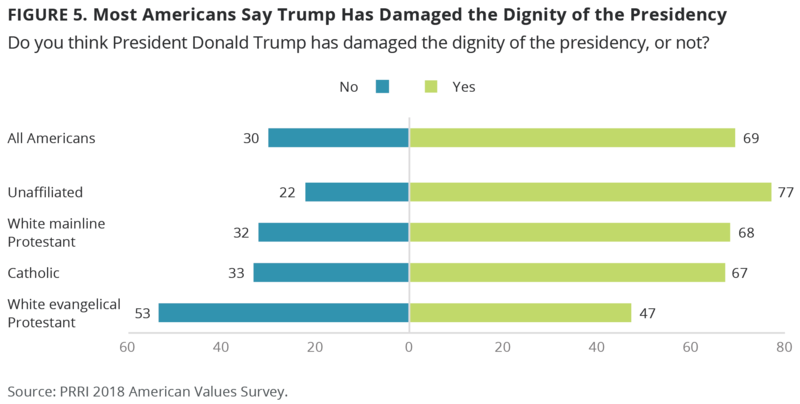 A majority (53%) of white evangelical Protestants say that President Trump has not damaged the dignity of the presidency. Similarly, almost seven in ten (69%) Americans say that they would like President Trump’s speech and behavior to be more consistent with his predecessors, while 29% disagree. There is some bipartisan agreement on this question. More than eight in ten (84%) Democrats, two-thirds (67%) of independents, and even a majority (57%) of Republicans report that they wish President Trump’s conduct was more consistent with that of previous presidents. While Democrats’ attitudes are similar across demographic lines, there are notable differences among Republicans. Republican women are more likely than Republican men to say they wish that President Trump’s behavior was consistent with past presidents’ conduct (66% vs. 49%). In addition, Republicans with a four-year college degree are more likely than those without a degree to express this sentiment (69% vs. 52%). A majority (54%) of Americans say that President Trump’s decisions and behavior as president have encouraged white supremacist groups, compared to just five percent who believe the president has discouraged white supremacist groups. Nearly four in ten (39%) say Trump’s behavior has had no effect on white supremacist groups. Notably, nonwhite Republicans are about four times more likely than white Republicans to say that Trump has encouraged white supremacist groups (37% vs. 9%). The vast majority (83%) of white Republicans think that Trump’s conduct has had no impact on white supremacists. There is far more agreement among Democrats. Almost nine in ten (89%) Hispanic Democrats and eight in ten black (82%) and white (81%) Democrats say that Trump’s decisions and behavior as president have encouraged white supremacist groups. White Christians stand out compared to other religious groups on this issue. Majorities of black Protestants (75%), religiously unaffiliated Americans (69%), Hispanic Catholics (68%), non-Christians (64%), and Hispanic Protestants (63%) say that Trump’s decisions and behavior have encouraged white supremacists. By contrast, less than half of white mainline Protestants (43%) and white Catholics (43%) and only 26% of white evangelical Protestants share this view. Nearly six in ten (59%) Americans believe that President Trump has not used his authority to pardon appropriately, compared to 38% who think that he has used his pardon power appropriately. A majority of Democrats (85%) and independents (61%), compared to just one in five (21%) Republicans, say that the president has not used his authority to pardon appropriately. More than three-quarters (76%) of Republicans say that Trump has used his authority to pardon appropriately. Overall, Americans have a positive view of the FBI. Nearly two-thirds (65%) of Americans say they have a favorable opinion of the FBI, compared to just 29% who say they view the FBI unfavorably. Majorities of both major political parties have a favorable view of the FBI, though Democrats are more likely than Republicans to view the institution favorably. More than seven in ten (73%) Democrats and over half (57%) of Republicans say they have a positive opinion of the FBI. Political independents’ views mirror those of the general public. Two-thirds (67%) of seniors (ages 65 and older), compared to 56% of young Americans (ages 18-29), report having a generally favorable view of the FBI. Nearly four in ten (39%) young Americans say their opinion of the FBI is unfavorable. Nearly seven in ten (69%) black Americans report having a favorable opinion of the FBI, compared to 64% of white Americans and 60% of Hispanic Americans. The general public is fairly split on their overall opinion of Robert Mueller, the special counsel appointed to investigate Russian interference in the 2016 presidential election. Nearly four in ten (39%) Americans say they have a favorable opinion of Mueller, compared to 45% who say they have an unfavorable opinion and 14% who say they have not heard of Mueller. The opinions of partisans about Robert Mueller diverge substantially. Nearly six in ten (59%) Democrats, compared to only 17% of Republicans, say their opinion of Mueller is positive overall. By contrast, more than seven in ten (71%) Republicans report having an unfavorable view of Mueller. Nearly half (48%) of black Americans report having a favorable opinion of Mueller, compared to only 38% of white Americans and 31% of Hispanic Americans. Nearly half of whites (47%) and Hispanics (47%) say their overall opinion of the special counsel is unfavorable. Among whites, there are notable educational differences. More than half (54%) of whites with a college degree view Mueller favorably, compared to only 30% of whites without a college degree. Three-quarters (75%) of Americans say they have an unfavorable view of Russia, including 35% who hold a very unfavorable view. Just 14% of Americans view Russia favorably. There are only minor partisan differences in views of Russia. More than eight in ten (82%) Democrats say they have an unfavorable opinion of Russia, compared to nearly three-quarters of Republicans (74%) and independents (73%). There are modest generational divides in views of Russia. Nearly eight in ten (79%) seniors report having an unfavorable opinion of Russia. By contrast, two-thirds (67%) of young Americans say they have an unfavorable view of Russia, while nearly one in five (19%) have a favorable opinion and 15% say they have not heard of Russia or have no opinion. Views of Russian President Vladimir Putin closely track views of Russia overall, with eight in ten (80%) Americans saying they view Putin unfavorably. Only 10% of Americans say they have a favorable opinion of him. The majority of Americans hold an adversarial view of Russia. Almost seven in ten view Russia as either unfriendly (45%) or an enemy of the U.S. (23%). Only about three in ten view Russia as either friendly (24%) or an ally of the U.S. (5%). Compared to one year ago, Americans today are more likely to view Russia as unfriendly. In 2017, about half of Americans viewed Russia as either unfriendly (31%) or an enemy (24%). There are notable differences between partisans on whether Russia is an enemy or an ally. Nearly half of Democrats (45%) and Republicans (46%) say Russia is unfriendly, although Democrats are about twice as likely as Republicans to say that Russia is an enemy of the U.S. (33% vs. 15%). Seniors are twice as likely as young Americans to say that they consider Russia to be an enemy (32% vs. 16%). By contrast, young Americans are more likely than seniors to say relations with Russia are friendly (31% vs. 15%). Americans generally do not think that institutions are doing a good job responding to issues of sexual harassment and assault. Majorities of Americans say that the Republican Party (63%), churches and places of worship (62%), colleges and universities (55%), and the Democratic Party (51%) are not handling these issues well. By contrast, 54% of Americans say that businesses are handling issues of sexual harassment and assault at least somewhat well, while 43% of Americans say businesses are not handling these issues well. Americans do not generally think that the two major political parties are doing a good job responding to sexual harassment and assault. More than six in ten (63%) Americans say the Republican Party is not responding well to these issues, while 51% say the Democratic Party is not handling these issues well. Women are slightly more likely than men to say that the Republican Party is doing a poor job handling issues of sexual assault and harassment (66% vs. 60%). There is no notable gender divide on assessments of the Democratic Party. Partisans generally think their own political party is doing a good job responding to these issues. More than six in ten Republicans (65%) and Democrats (63%) say their own party handles sexual harassment and assault at least somewhat well. By contrast, just about one-third (35%) of Republicans and 16% of Democrats say the opposite party is responding well to these issues. More than eight in ten (83%) Democrats say the Republican Party is doing a poor job responding to sexual harassment and assault. There are notable gender divides within the parties. Among both Democrats and Republicans, men (69% and 71%) are more likely than women (59% and 58%) to say their own party is responding well to the issue of sexual harassment and assault. More than six in ten (62%) Americans say that churches and places of worship are not responding well to issues of sexual harassment and assault. Just about one-third (36%) say these institutions are responding well. Women and men are about equally likely to say that places of worship are doing a poor job of handling these issues. 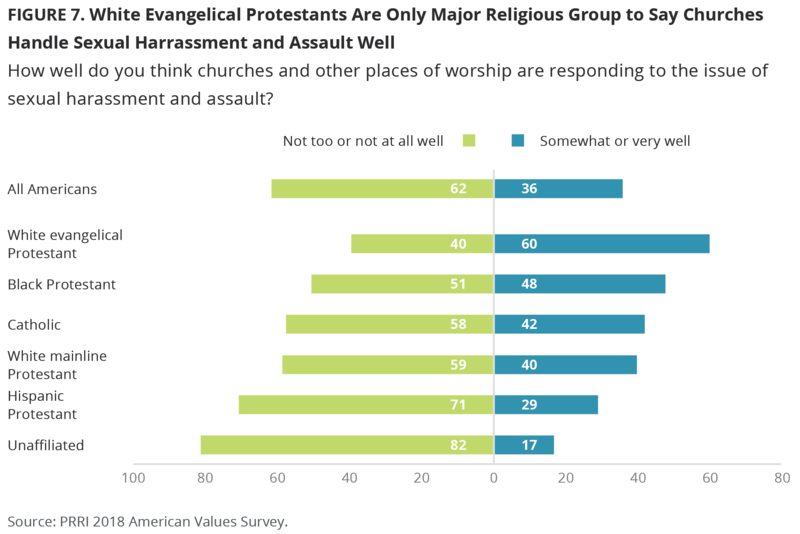 With the exception of white evangelical Protestants, Americans from different religious traditions generally agree that churches and places of worship are not responding well to issues of sexual harassment and assault. Majorities of religiously unaffiliated Americans (82%), Hispanic Catholics (63%), white mainline Protestants (59%), and white Catholics (55%) say that churches and religious institutions are handling these issues poorly, compared to just four in ten (40%) white evangelical Protestants. Six in ten (60%) white evangelical Protestants believe churches and places of worship are handling these issues well. With the exception of Catholics, men and women who belong to the same religious tradition have similar opinions on this issue. However, Catholic women are significantly more likely than Catholic men to say that churches and places of worship are handling issues of sexual harassment and assault poorly (66% vs. 48%). Young Americans (ages 18-29) are more likely than seniors (ages 65 and older) to say that churches and places of worship are handling this issue poorly. Two-thirds (67%) of young Americans, compared to 52% of seniors, say that religious institutions are handling issues of sexual harassment and assault poorly. A majority (54%) of Americans feel that businesses are responding well to issues of sexual harassment and assault, compared to about four in ten (43%) who say businesses are not responding well. Women and men are about equally likely to say that businesses are doing well in responding to issues of sexual harassment and assault. Republicans are significantly more likely than Democrats to say that businesses are handling these issues well (69% vs. 45%). There are no notable gender gaps among partisans. Seniors are more likely than young Americans to agree that businesses are handling these issues well. Almost six in ten (57%) seniors say businesses are handling issues of sexual harassment and assault well, compared to less than half (46%) of young Americans. Almost half of Americans say that #MeToo movement has had a positive impact. About half (48%) say it has helped address sexual harassment and assault in the workplace. Less than one in five (18%) say it has led to the unfair treatment of men, and 16% say it has not really made any difference. Almost one in five (17%) Americans say they have not heard of the #MeToo movement. There is a sharp gender divide on the impact of #MeToo. 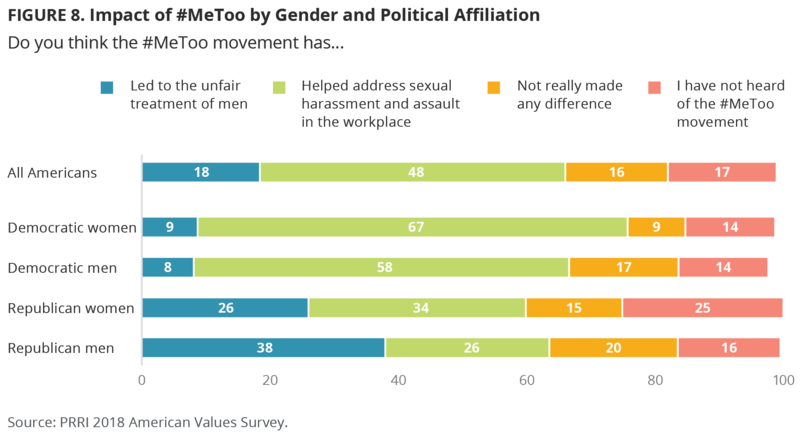 Women are more likely than men to say that #MeToo has helped address sexual harassment and assault in the workplace (53% vs. 42%), while men are more likely than women to say that the movement has led to unfair treatment of men (23% vs. 14%). There are also stark partisan divides on the movement’s impact. Democrats are more than twice as likely as Republicans to say that #MeToo has helped address issues of sexual harassment and assault in the workplace (64% vs. 29%). By contrast, Republicans are nearly four times as likely as Democrats to say that the movement has led to men being treated unfairly (33% vs. 9%). Among Republicans, men are more likely than women to say that #MeToo has resulted in men being treated unfairly (38% vs. 26%) and less likely to say that it has helped address sexual harassment and assault in the workplace (26% vs. 34%). Among Democrats, women are more likely than men to say that #MeToo has helped address sexual harassment and assault in the workplace (67% vs. 58%). Americans of different racial and ethnic backgrounds perceive the #MeToo movement differently. White Americans (21%) are more likely than Hispanic (14%) and black (10%) Americans to say that #MeToo has led to men being treated unfairly. Among whites, those with a four-year college degree are more likely than those without a degree to say that #MeToo has helped address issues of sexual harassment and assault in the workplace (60% vs. 39%). Whites without a college degree, however, are no more likely than whites with a college degree to say the movement has negatively impacted men (22% vs. 21%). There are also gender differences among racial and ethnic groups. Among both Hispanic and white Americans, women (60% and 51%) are more likely than men (35% and 41%) to say that that #MeToo has helped address issues of sexual harassment and assault in the workplace. By contrast, Hispanic and white men (21% and 27%) are more likely than Hispanic and white women (9% and 16%) to say that #MeToo has led to men being treated unfairly. There are slight generational differences in how #MeToo is viewed. Though seniors and young Americans are about equally likely to say that the movement has helped address issues in the workplace (52% vs. 49%), seniors are slightly more likely than young Americans to say that men have been unfairly treated as a result of the #MeToo movement (18% vs. 12%). Young women are more likely than young men to say that #MeToo has helped address issues of sexual harassment and assault in the workplace (55% vs. 43%). Young women are also less likely than young men to say that #MeToo has led to men being treated unfairly (6% vs. 18%). Almost four in ten (38%) Americans agree that that discrimination against men has become as big a problem as discrimination against women, compared to 61% who disagree. Men are more likely than women to say that discrimination against men is as big a problem as discrimination against women (44% vs. 31%). There are sharp partisan divides on this issue. A majority (53%) of Republicans, compared to just 27% of Democrats, agree that discrimination against men is as big a problem as discrimination against women. Among Republicans, men (63%) are much more likely than women (44%) to express this sentiment. There are no comparable differences between Democratic men and women. There are notable generational divides on this issue. More than four in ten (45%) seniors agree that discrimination against men is as big a problem as discrimination against women, compared to just 30% of young Americans. Senior men are much more likely than senior women to think that discrimination against men is as big a problem as discrimination against women (57% vs. 34%). The American public is divided on whether the feminist movement accurately reflects the views of most women. More than half (51%) agree with this notion, while almost as many (47%) disagree. A majority (56%) of women, compared to only 46% of men, say the feminist movement reflects the views of most women. Democrats are more than twice as likely as Republicans to see the feminist movement as representative of women’s views. More than seven in ten (72%) Democrats think the feminist movement accurately reflects the views of most women, while only one-third (33%) of Republicans agree. There are no substantive gender divides among Democrats and Republicans. There are sharp racial and ethnic divides on this question. Nearly two-thirds of black (66%) and Hispanic (65%) Americans believe that the feminist movement accurately reflects the views of most women, compared to less than half (45%) of white Americans. White Americans with and without a four-year college degree are about equally likely to express this sentiment. Americans are divided on whether American culture and way of life have changed for the better (50%) or for the worse (47%) since the 1950s. Attitudes on this issue have remained relatively stable since 2015. A majority of black (56%) and Hispanic Americans (55%) say that things have mostly gotten better since the 1950s, while white Americans are more divided: 47% of white Americans say things have improved, while more than half (51%) say things have mostly gotten worse. Among white Americans, those with a four-year college degree are more likely than those without a degree to say that American culture has mostly changed for the better (58% vs. 40%). There are significant partisan divides on this issue. Six in ten (60%) Democrats and a majority (53%) of independents say that things have mostly changed for the better since the 1950s. Only about one-third (34%) of Republicans hold this view, while nearly two-thirds (64%) say that things have mostly changed for the worse. Seniors (ages 65 and older) are notably more likely than young Americans (ages 18-29) to express nostalgia for the 1950s. Seniors are more likely than young Americans to say that things have changed for the worse since the 1950s (55% vs. 39%). Four in ten (43%) seniors say that things have mostly changed for the better, compared to almost six in ten (58%) young Americans who express this sentiment. While there is no significant gender gap among young people, senior men are significantly more likely than senior women to say that American culture has mostly changed for the worse (62% vs. 49%). Nearly two-thirds (64%) of Americans say that the U.S. becoming a majority-nonwhite nation by 2045 will be a mostly positive change. One-third (33%) of Americans say that the impact of this demographic shift will be mostly negative. While about eight in ten Hispanic (80%) and black (79%) Americans say that the impact of the U.S. becoming a majority-nonwhite country will be mostly positive, significantly fewer (55%) white Americans hold this view. Among white Americans, those with a four-year college degree are more likely than those without a degree to view this demographic change positively (67% vs. 48%). There are no substantive gender divides among racial and ethnic groups. Views of the coming demographic realignment differ sharply among partisans. Eight in ten (80%) Democrats and two-thirds (67%) of independents, compared to only 36% of Republicans, say that the growth of the nonwhite population will be a positive change. More than six in ten (61%) Republicans believe that the shift to being a majority-nonwhite country will be a mostly negative development. With the exception of white evangelical Protestants, all other major religious groups believe that the country’s racial and ethnic realignment will be mostly positive. Majorities of Hispanic Catholics (81%), black Protestants (80%), religiously unaffiliated Americans (74%), white Catholics (51%), and white mainline Protestants (51%) believe that this change will be mostly positive, while less than half (44%) of white evangelical Protestants hold this view. A majority (54%) of white evangelical Protestants say that becoming majority-nonwhite nation in the future will be mostly negative. Seniors are notably divided in their attitudes toward the impact of these projections. A slim majority (52%) of seniors, including less than half (46%) of senior men, say that these demographic changes will be mostly positive. By contrast, fully three-quarters (75%) of young Americans hold this view. Nearly half (47%) of Americans say that things have changed so much they often feel like a stranger in their own country, while a slim majority (51%) disagree. Feelings of cultural alienation have risen since 2016, when 41% of Americans agreed with this statement. Nearly six in ten (58%) Republicans say that things have changed so much they often feel like a stranger in their own country—an increase from 2016 when less than half (49%) of Republicans felt this way. Only about four in ten (42%) Democrats say that they feel like a stranger in their own country, although this is also an increase over the last two years; in 2016, one-third (33%) of Democrats felt this way. Americans are similarly divided on whether the American way of life needs to be protected from foreign influence. Half (50%) of Americans believe American culture needs to be protected, while a similar number (48%) disagree. There is a notable gender gap on this issue. A majority (56%) of men, but only 46% of women, agree that the American way of life needs to be protected from foreign influence. White Americans are more likely than nonwhite Americans to worry about the country’s vulnerability to foreign influence. A majority (56%) of white Americans agree that the American way of life needs to be protected from foreign influence, while less than half (45%) of black Americans and about one-third (37%) of Hispanic Americans hold this view. Among white Americans, those with a four-year college degree are far less likely than those without a degree to say that that the American way of life needs to be protected from foreign influence (41% vs. 65%). Additionally, white men are more likely than white women to express this sentiment (61% vs. 51%). There are strong partisan divides on this issue. More than three-quarters (76%) of Republicans believe the American way of life needs to be protected from foreign influence. By contrast, less than half (46%) of independents and just 39% of Democrats agree with this statement. Seniors are nearly twice as likely as young Americans to agree that the American way of life needs to be protected from foreign influence (63% vs. 34%). Nearly half (45%) of young men say the American way of life needs protection from foreign influence, while less than one-quarter (24%) of young women hold this view. There is no comparable gender divide among seniors. Four in ten (40%) Americans say that America has always been and is currently a Christian nation, while nearly as many (38%) say that America was a Christian nation in the past but is not now. Almost one in five (19%) say that America has never been a Christian nation. Compared to two years ago, Republicans are more likely now to say that America always has been and continues to be a Christian nation. In 2016, about four in ten (44%) Republicans said that American has always been and currently remains a Christian nation, while a slim majority (51%) said that America was a Christian nation in the past but is not currently. Views among Democrats have not shifted significantly in that time. There are stark age differences on this question. Close to six in ten (56%) seniors say that America is still a Christian nation. Three in ten (30%) say it once was but is no longer a Christian nation, and only about one in ten (12%) say America was never a Christian nation. By contrast, around one-quarter (27%) of young Americans believe America has always been and remains a Christian nation, while nearly half (45%) say it was a Christian nation in the past but is not now. About one-quarter (24%) of young Americans believe that America was never a Christian nation. Americans are divided on whether restrictions should be placed on legal immigration. A slim majority (51%) of Americans favor passing a law that places stricter limits on the number of legal immigrants coming to the U.S., while nearly as many (47%) oppose such a law. There are stark differences in attitudes among partisans. Nearly eight in ten (78%) Republicans favor stricter limits on the number of legal immigrants coming to the U.S. By contrast, only about one-third (36%) of Democrats hold this view. The views of independents mirror those of the general public. White Americans stand out for their support for restricting legal immigration. A majority (56%) of white Americans, compared to four in ten black (42%) and Hispanic (42%) Americans, favor placing stricter limits on the number of legal immigrants. Among white Americans, those without a four-year college degree are more likely than those who hold a degree to favor immigration limits (64% vs. 41%). Young Americans and seniors have markedly different opinions on this issue. Less than four in ten (39%) young Americans, compared to 62% of seniors, favor reducing legal immigration. A majority of Americans oppose building a wall between the U.S. and Mexico. Nearly six in ten (58%) oppose building a wall between the U.S. and Mexico, while about four in ten (41%) Americans favor this policy. Opposition to the border wall has not changed over the last two years, when the same number (58%) of Americans were in favor of building a wall along the U.S.-Mexico border. While more than seven in ten Hispanic (72%) and black (72%) Americans oppose building a wall along the U.S.-Mexico border, just half (50%) of white Americans hold the same view. Roughly the same number (48%) of white Americans favor building a wall along the border. Among white Americans, those without a four-year college degree are more likely than those with a degree to favor this policy (55% vs. 35%). Partisans are deeply divided on this issue. Eight in ten (80%) Republicans favor building a wall along the border, including nearly half (45%) who strongly favor such a policy. By contrast, eight in ten (80%) Democrats oppose building a wall along the border, including more than six in ten (61%) who are strongly opposed. Only about one in five (19%) Democrats favor building a wall along with U.S.-Mexico border. Independents’ views (62% oppose) mirror those of the general public. Over the last two years, Republicans and Democrats have become increasingly polarized on their attitudes toward building a wall between the U.S. and Mexico. In 2016, about two-thirds (66%) of Republicans favored building a wall, including three in ten (30%) who strongly favored this policy, while three-quarters (75%) of Democrats were opposed, including nearly half (48%) who were strongly opposed. Preventing Refugees From Entering the U.S. Most Americans oppose the passage of a law that would stop refugees from coming to the U.S. Six in ten (60%) oppose passing a law to prevent refugees from entering the U.S., while nearly four in ten (37%) are in favor of such a law. Opposition to this policy has remained stable over the past year. While majorities of Democrats and independents oppose a measure to prevent refugees from entering the U.S., a majority of Republicans favor such a policy. Three-quarters (75%) of Democrats and nearly two-thirds (65%) of independents oppose passing a law that would prevent refugees from entering the country. Only about one-third (36%) of Republicans hold this view. More than six in ten (63%) Republicans favor passing a law that would prevent refugees from entering the U.S. 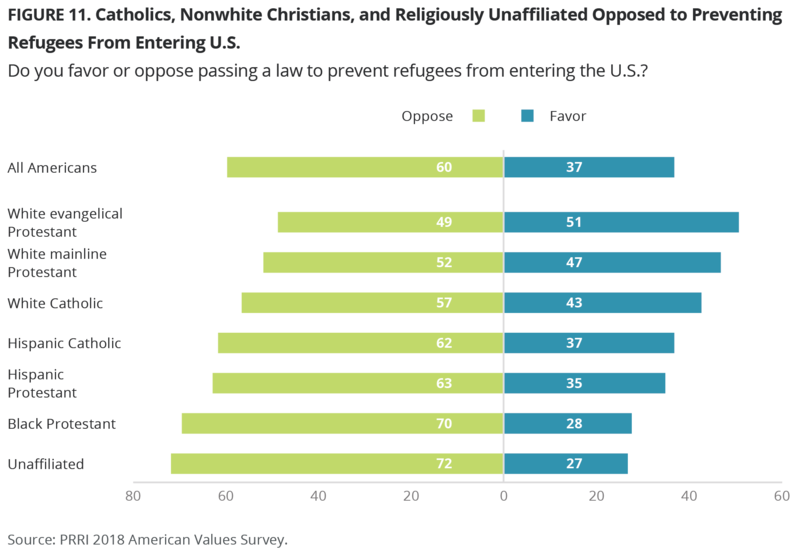 While white Protestants are divided in their views of this policy, Catholics, nonwhite Christians, and religiously unaffiliated Americans oppose the passage of a law preventing refugees from entering the U.S. About six in ten white Catholics (57%), Hispanic Catholics (62%), and Hispanic Protestants (63%) are opposed to a law that would prevent refugees from entering the U.S., along with about seven in ten black Protestants (70%) and religiously unaffiliated Americans (72%). A slim majority (51%) of white evangelical Protestants favor this policy, although a similar number (49%) are opposed. White mainline Protestants are also divided, with 47% in support of a law preventing access for refugees and a slim majority (52%) opposed. Americans are divided over a travel ban for people from some majority-Muslim countries. Roughly equal numbers of Americans favor (49%) and oppose (50%) temporarily preventing people from some majority-Muslim countries from entering the U.S. Notably, support for these travel restrictions has increased in the past year. In 2017, four in ten (40%) Americans were in support of such a policy. White Americans are more likely than Hispanic and black Americans to favor restricting travel for people from some majority-Muslim countries. Nearly six in ten (56%) white Americans favor temporarily preventing people from some majority-Muslim countries from entering the U.S. By contrast, less than four in ten (37%) Hispanic Americans and about three in ten (31%) black Americans favor such a policy. Partisans are deeply divided on this policy. More than eight in ten (82%) Republicans favor a temporary travel ban for people from some majority-Muslim countries, compared to less than half (45%) of independents and only three in ten (30%) Democrats. Support for this policy has increased across party lines over the last year. In 2017, about two-thirds (66%) of Republicans, about four in ten (37%) independents, and 23% of Democrats favored a similar temporary travel ban. There is wide variation in views of this policy among religious groups. More than seven in ten (72%) white evangelical Protestants and about six in ten white mainline Protestants (63%) and white Catholics (60%) favor a temporary travel ban for people from some majority-Muslim countries. Hispanic Protestants are more divided, with 46% in favor of such travel restrictions and a majority (54%) opposed. By contrast, only about one-third of religiously unaffiliated Americans (35%), Hispanic Catholics (34%), and black Protestants (34%) favor temporarily preventing people from some majority-Muslim countries from entering the U.S. Seniors are notably more likely than young Americans to support travel restrictions for people from some majority-Muslim countries. Nearly six in ten (58%) seniors, compared to only about one-third (36%) of young Americans, favor temporarily preventing people from some majority-Muslim countries from entering the U.S. The Trump administration policy of separating children from their parents at the border remains deeply unpopular. Only about one-quarter (26%) of Americans favor an immigration border policy that separates children from their parents and charges parents as criminals when they enter the U.S. without permission, while more than seven in ten (72%) are opposed. Opposition to the policy of family separation at the border has remained stable since June 2018, when a similar number (71%) of Americans were opposed. Strong majorities of Americans of all races and ethnicities are opposed to a policy that separates families at the border. About eight in ten black (82%) and Hispanic (78%) Americans, as well as nearly seven in ten (69%) white Americans, are opposed to separating children from their parents and charging parents as criminals at the border. Among whites, those with a four-year college degree are more likely than those without a degree to oppose such a policy (76% vs. 65%). Democrats are strongly united in their opposition to the policy of family separation, while Republicans are divided in their attitudes toward this policy. Nine in ten (90%) Democrats oppose a border policy that separates children from their parents, including more than seven in ten (72%) who are strongly opposed. Less than half (47%) of Republicans are opposed to this policy, while a majority (53%) are in favor. Notably, majorities of all major religious groups are opposed to family separation at the border. Close to six in ten (56%) white evangelical Protestants, along with about two-thirds of white mainline Protestants (68%), white Catholics (69%), and Hispanic Catholics (71%), are opposed to a policy that separates children from their parents at the border. About eight in ten religiously unaffiliated Americans (79%), Hispanic Protestants (81%), and black Protestants (85%) are also opposed to such a policy. Most Americans are supportive of the basic policies behind the Deferred Action for Childhood Arrivals (DACA) program. More than six in ten (62%) Americans favor allowing immigrants brought illegally to the U.S. as children to gain legal resident status, while about one-third (35%) are opposed. Support for this policy has remained stable since March 2018, when about six in ten (62%) Americans favored allowing immigrants brought to this country illegally as children to gain legal resident status. There are no substantial divisions on this issue by race and ethnicity. Six in ten (60%) white Americans, about two-thirds (65%) of black Americans, and more than seven in ten (71%) Hispanic Americans favor allowing immigrants brought illegally to the U.S. as children to gain legal resident status. Nearly eight in ten (78%) Democrats and 61% of idependents, compared to only 44% of Republicans, support allowing immigrants brought to the U.S. illegally as children to gain legal resident status. A majority (55%) of Republicans oppose this policy. Americans largely favor a merit-based immigration system. More than six in ten (63%) Americans favor implementing a system that favors applicants based upon their skills, education, and ability to speak English. About one-third (34%) are opposed to such a system. There are modest differences by race and ethnicity. A majority (54%) of Hispanic Americans, compared to nearly six in ten (59%) black Americans and close to two-thirds (66%) of white Americans, favor implementing an immigration system based on applicants’ skills, education, and English proficiency. There are stark differences across party lines in attitudes toward a merit-based immigration system. Nearly nine in ten (86%) Republicans favor implementing a merit-based immigration system. By contrast, Democrats are much more divided, with half (50%) favoring such a system and nearly as many (48%) opposed. The views of independents mirror those of the general public. More than four in ten (44%) Americans favor allowing cities to limit their cooperation with the federal government’s effort to enforce immigration laws, while a majority (52%) are opposed. Forty-two percent of white Americans favor allowing cities to limit their cooperation with the federal government’s immigration enforcement efforts, while 56% of are opposed. By contrast, black Americans (49% favor, 46% oppose) and Hispanic (50% favor, 46% oppose) are more divided on whether cities should be allowed to limit their cooperation with federal immigration authorities. Nearly six in ten (58%) Democrats, compared to only 30% of Republicans, favor allowing cities to restrict cooperation with the federal government’s immigration authorities. Nearly seven in ten (69%) Republicans oppose allowing cities to restrict their cooperation with the federal government on immigration. When asked how to deal with immigrants who are currently living in the U.S. illegally, more than six in ten (62%) Americans say the immigration system should allow them a way to become citizens provided they meet certain requirements. Sixteen percent say that the system should allow them to become permanent legal residents, but not citizens, and about one in five (21%) say the immigration system should identify and deport them. Views on immigration reform have not changed significantly since 2013, when a similar number (63%) favored giving immigrants living in the U.S. illegally a way to become citizens provided they meet certain requirements. Majorities of all Americans, regardless of race or ethnicity, favor providing immigrants living in the U.S. illegally with a way to become citizens. About six in ten white (59%) and black (64%) Americans and seven in ten (70%) Hispanic Americans believe that the immigration system should include a way for immigrants living in the country illegally to become citizens. While only about one in ten Hispanic (11%) and black (13%) Americans want the immigration system to identify and deport immigrants living in the U.S. illegally, one-quarter (25%) of white Americans hold this view. 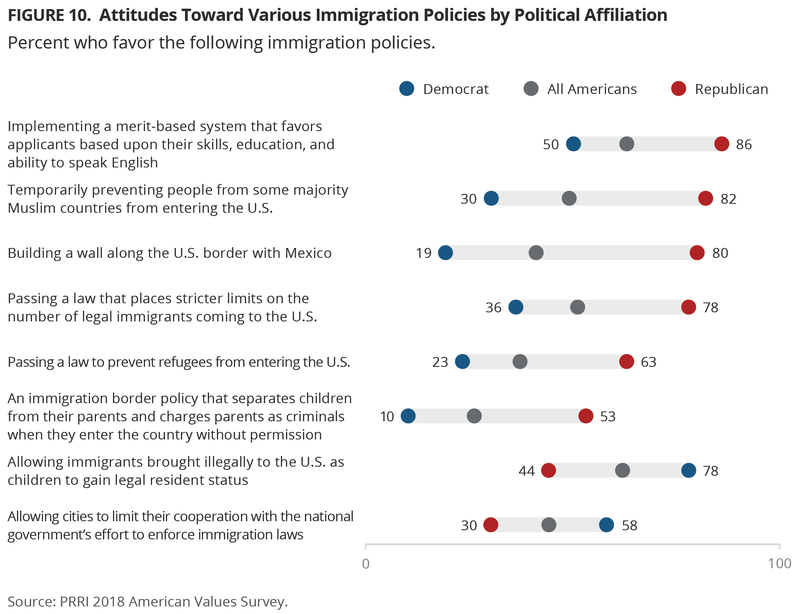 While Democrats strongly support a path to citizenship, Republicans exhibit less support and are more divided in their attitudes on immigration reform. Fully three-quarters (75%) of Democrats say that the immigration system should allow those living in the U.S. illegally a way to become citizens provided they meet certain requirements. Democrats’ views on this have not shifted since 2016. A plurality (42%) of Republicans believe that the immigration system should identify and deport those immigrations living here illegally, though nearly as many (39%) prefer a path to citizenship. About one in five (19%) Republicans say the immigration system should allowing those living in the U.S. illegally to become permanent legal residents, but not citizens. Support for deportation is up 14 points among Republicans over the last two years; in 2016, only 28% said identifying and deporting immigrants in the country illegally was their preferred policy. Similarly, Republican support for a path to citizenship is down from 2016, when a majority (55%) said that the immigration system should allow those living in the U.S. illegally a way to become citizens if they met certain requirements. Only about one-quarter (27%) of Americans believe the U.S. should give preference to immigrants from Western Europe, while seven in ten (70%) disagree. Across race and ethnicity, Americans hold similar views. About seven in ten black (66%), Hispanic (69%), and white (72%) Americans disagree that we should give preference to immigrants from Western Europe. There are slight differences in views among partisans, although majorities of people who identify with both major political parties disagree that the U.S. should give preference to immigrants from Western Europe. More than three-quarters (78%) of Democrats and about seven in ten (71%) independents, compared to 58% of Republicans, do not believe preference should be given to immigrants from Western Europe. More than four in ten (41%) Republicans believe the U.S. should give preference to Western European immigrants. Americans tend to view immigrants positively overall, although sizable minorities believe that immigrants negatively impact local communities. More than eight in ten say the attributes “hardworking” (86%) and “have strong family values” (84%) describe immigrants coming to the U.S. today very or somewhat well. Three-quarters (75%) agree that “mostly keep to themselves” describes immigrants well. A majority (56%) of Americans also say that immigrants make an effort to learn English. About half (49%) of Americans say that immigrants burden local communities by using more than their share of social services, and nearly four in ten (39%) say that immigrants increase crime in local communities. A slim majority (51%) of white Americans, compared to about two-thirds of Hispanic (65%) and black (66%) Americans, say the phrase “they make an effort to learn English” describes immigrants very or somewhat well. White Americans are also slightly more likely than black or Hispanic Americans to say that immigrants burden local communities by using more than their share of social services (52%, 43%, and 42%, respectively) or that immigrants increase crime in local communities (43%, 33%, and 32%, respectively). There are deep partisan divides on these questions. 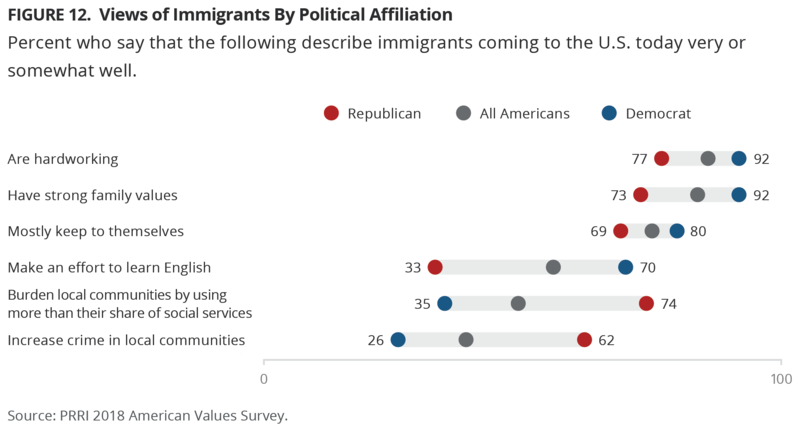 Democrats are more likely than Republicans to say that immigrants are hardworking (92% vs. 77%), have strong family values (92% vs. 73%), and make an effort to learn English (70% vs. 33%). By contrast, Republicans are more likely than Democrats to say that immigrants burden local communities by using more than their share of social services (74% vs. 35%) and that immigrants increase crime in local communities (62% vs. 26%). There are substantial differences in views of immigrants by generation. Young Americans and seniors are about equally likely to say that “hardworking” (86% vs. 85%), “have strong family values” (85% vs. 85%), and “mostly keep to themselves” (72% vs. 77%) describe immigrants at least somewhat well. However, young Americans are more likely than seniors to say that immigrants make an effort to learn English (65% vs. 50%). Conversely, seniors are more likely than young Americans to say that immigrants burden local communities by using more than their share of social services (62% vs. 32%) or that they increase crime in local communities (48% vs. 30%). A majority (58%) of Americans say they are not bothered when they come into contact with immigrants who speak little or no English. About four in ten (41%), however, say they are bothered by encounters with immigrants who do not speak English. Americans of different racial and ethnic backgrounds hold varying attitudes toward immigrants who do not speak English. Nearly three-quarters (74%) of Hispanic Americans and about two-thirds (65%) of black Americans, compared to a slim majority (51%) of white Americans, report that it does not bother them when they come into contact with immigrants who speak little or no English. Partisans have divergent views on immigrants who do not speak English. Seven in ten (70%) Democrats, compared to only 37% of Republicans, say they are not bothered by immigrants who do not speak English. More than six in ten (62%) Republicans say they are bothered by immigrants who do not speak English. Do Immigrants Threaten or Strengthen American Society? When asked about their perspective on the country’s growing number of newcomers, six in ten (60%) Americans say that in general, newcomers strengthen American society, while more than one-third (37%) say they threaten traditional American customs and values. Although majorities of Americans of all racial and ethnic groups agree that in general, immigrants strengthen American society, the intensity of this belief varies. More than seven in ten (72%) Hispanic Americans, about six in ten (63%) black Americans, and 55% of white Americans say that the growing number of immigrants strengthens American society. Among white Americans, those with a four-year college degree are more likely than those without a degree to say that immigrants strengthen American society (72% vs. 46%). A majority (52%) of white Americans without a college degree say that immigrants threaten traditional American customs and values. More than three-quarters (76%) of Democrats say that immigrants strengthen American society. By contrast, only about one-third (34%) of Republicans hold this view, and nearly two-thirds (65%) believe that immigrants threaten American values. The views of independents mirror those of the general public. White evangelical Protestants are the only major religious group in which a majority believe that immigrants threaten American society. Almost six in ten (57%) white evangelical Protestants say that immigrants threaten traditional Americans customs and values, while about four in ten (43%) say that they strengthen American society. White mainline Protestants and white Catholics are about as likely to say that the growing number of immigrants threatens American society (48% and 47%, respectively) as they are to say that immigrants strengthen American society (50% and 51%, respectively). About two-thirds of Hispanic (63%) and black (67%) Protestants and about three-quarters of religiously unaffiliated Americans (73%) and Hispanic Catholics (76%) say that immigrants strengthen American society. When asked whether immigrants strengthen our country or are a burden, most Americans again say that immigrants strengthen the U.S. Nearly two-thirds (64%) of Americans say that immigrants today strengthen our country because of their hard work and talents, compared to one-third (33%) who say that they are a burden on our country because they take jobs, housing, and health care. Various demographic groups’ views about immigrants’ impact on the U.S. are similar to their beliefs about whether immigrants strengthen or threaten American society. For instance, partisans are deeply divided over the impact of immigration. Nearly eight in ten (79%) Democrats and more than two-thirds (68%) of independents, compared to only 37% of Republicans, say that immigrants strengthen the country because of their hard work and talents. More than six in ten (62%) Republicans say instead that immigrants are a burden because they take jobs, housing, and health care. In general, Americans are divided about what should happen to Confederate monuments that are currently standing on public property. 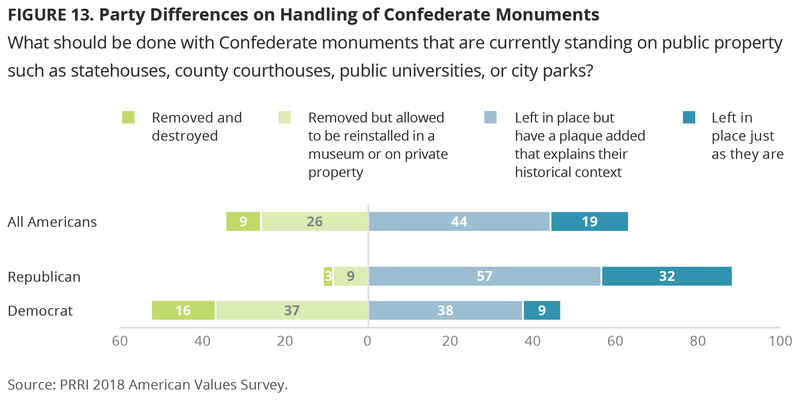 Less than one in five (19%) say they should be left in place just as they are, but a plurality (44%) say the monuments should be left in place but have a plaque added that explains their historical context. Roughly one-quarter (26%) say they should be removed but allowed to be reinstalled in a museum or on private property, and nearly one in ten (9%) say the monuments should be removed and destroyed. Nearly three-quarters of white Americans say either that Confederate monuments should be left in place with a plaque explaining the historical context (49%) or that they should remain just as they are (24%). Only 22% of white Americans say the monuments should be removed and reinstalled on private property, and very few (4%) support their removal and destruction. By contrast, two-thirds of black Americans say they would like to see these monuments removed from public spaces, but would generally prefer that they be installed in a museum (40%) than destroyed completely (27%). Notably, black men are significantly more likely than black women to say they would like to see these monuments removed and destroyed (34% vs. 21%). The views of Hispanic Americans closely align with those of the general public. There are also stark political divides on this issue. Among Republicans, nearly nine in ten say either that Confederate monuments should stay exactly as they are (32%) or that they should be left in place with a historical plaque explaining their context (57%). By contrast, Democrats are more divided. Nearly half of Democrats say Confederate monuments should either remain in place with an historical plaque attached (38%) or be left in their current form (9%). And nearly half of Democrats say the monuments should either be removed and placed in a museum (37%) or removed and destroyed (16%). Perceptions of these monuments as either symbols of racism or Southern pride closely track with opinions about whether they should be removed. Over six in ten (62%) Americans say they see the monuments to Confederate soldiers more as a symbol of Southern pride, while about one-third (35%) say they see them more as symbols of racism. Attitudes toward renaming streets and buildings currently named after Confederate leaders also closely track opinions on removal of the monuments. Nearly two-thirds (65%) of Americans say they oppose changing the names of streets, schools, and other public buildings named after Confederate leaders. Only one-third (33%) of the public is in favor of changing these names. More than seven in ten (72%) white Americans oppose changing the names of streets, schools, and other public buildings named after Confederate leaders, compared to 56% of Hispanic Americans and 46% of black Americans. Among white Americans, those without a four-year college degree are more likely than those with a degree to say they oppose changing the names of streets and buildings named after leaders of the Confederacy (76% vs. 61%). Similar partisan divisions exist on this issue. Republicans (82%) are much more likely than Democrats (51%) to oppose changing the names of streets, schools, and public buildings named after Confederate leaders. Similar generational differences are present as well, with seniors (ages 65 and older) being much more likely than young Americans (ages 18-29) to say they oppose changing the names of streets, schools, and buildings named after leaders of the Confederacy (74% vs. 52%). A majority (53%) of Americans believe that recent killings of African American men by police are part of a broader pattern of how police treat African Americans, while more than four in ten (45%) say they are isolated incidents. These attitudes have shifted in the last few years. In 2015, just 44% of Americans said these killings were part of a broader pattern, and a majority (53%) said they were isolated incidents. There are large generational gaps on this issue. Nearly two-thirds (64%) of young Americans say that police killings of African American men are part of a broader pattern, compared to less than half (43%) of seniors. Notably, young women are likelier than young men to identify these killings as part of a broader pattern reflecting the treatment of African Americans by police (73% vs. 56%). Nearly three-quarters (73%) of Democrats and 54% of independents say the recent killings of African Americans are part of a broader pattern of how police treat African Americans. By contrast, only 22% of Republicans—including 27% of Republican women but only 19% of Republican men—say these killings are part of a broader pattern of African Americans’ treatment by police, while nearly eight in ten (77%) Republicans say these killings are isolated incidents. There are also stark racial and ethnic divides on this issue. An overwhelming majority of black Americans (82%) and more than six in ten (63%) Hispanic Americans view these killings as a broader pattern of how police treat African Americans, compared to only 44% of white Americans. Notably, whites are more likely today to think these killings are part of a broader pattern than they were a few years ago. In 2015, around one-third (34%) of whites viewed these killings as part of a broader pattern, compared to 65% who said they were isolated incidents. White evangelical Protestants stand out for the extent to which they believe recent killings of black men are isolated incidents. More than seven in ten (71%) of white evangelical Protestants say these killings are isolated incidents, a view shared by roughly six in ten white Catholics (63%) and white mainline Protestants (59%). In contrast, only about four in ten (43%) Hispanic Catholics and about one-third of religiously unaffiliated Americans (33%) and Hispanic Protestants (32%) say these killings are isolated incidents. Just 15% of black Protestants identify the recent killings of black men by police as isolated incidents, while more than eight in ten (84%) say they are part of a broader pattern. Americans are divided about whether professional athletes should be required to stand during the national anthem at sporting events. Half (50%) agree that they should have to stand, while roughly as many (47%) disagree. Support for requiring professional athletes to stand has dropped modestly over the past year, when roughly half (55%) said professional athletes should be required to stand and around four in ten (42%) said they should not. There are striking differences across race and ethnic groups on this issue. Six in ten (60%) white Americans agree that athletes should have to stand during the anthem, compared to less than half (42%) of Hispanic Americans and less than one-quarter (22%) of black Americans. Nearly three-quarters (74%) of black Americans say that athletes should not be required to stand during the national anthem at sporting events. While attitudes on this issue have remained stable for whites and blacks since 2017, support for requiring professional athletes to stand has dropped 18 percentage points among Hispanics over this period, from 60% in 2017 to 42% today. Nine in ten (90%) Republicans say professional athletes should be required to stand for the flag during the national anthem. By contrast, Democrats are more than twice as likely to disagree that this should be required of professional athletes (71%) than they are to agree (28%). Democrats are now slightly more likely to disagree that professional athletes should be required to stand for the national anthem than they were one year ago. In 2017, close to two-thirds (64%) of Democrats disagreed. There has been no notable change among Republicans. Seniors are more likely than young Americans to say they believe athletes should be required to stand during the national anthem (65% vs. 35%). Nearly three-quarters (73%) of Americans say there is a lot of discrimination against blacks in the country today. Women (79%) are more likely than men (68%) to say that blacks currently face a lot of discrimination. These perceptions vary across generations, with young Americans (79%) being much more likely than seniors (69%) to say that blacks face a lot of discrimination. Democrats (90%) are significantly more likely than Republicans (48%) to say there is a lot of discrimination against blacks in the country today. Only one-third (33%) of Americans say there is a lot of discrimination against whites in the country today. More than four in ten (41%) white Americans, compared to less than one in five black (18%) and Hispanic (18%) Americans, believe there is a lot of discrimination against whites in the country today. Republicans (48%) are also more likely than Democrats (22%) to say that whites face a lot of discrimination. Just under half (44%) of Americans say that there is a lot of discrimination against Asians in the country today. These attitudes largely do not differ across gender, age, or race. There are, however, significant partisan differences on this question. Democrats (50%) are more likely than Republicans (32%) to say that Asians face a lot of discrimination. Nearly seven in ten (69%) Americans say there is a lot of discrimination against Hispanics in the U.S. today. Women (73%) are more likely than men (64%) to say that Hispanics face a lot of discrimination. Black (80%) and Hispanic (77%) Americans are more likely than white Americans (64%) to say there is a lot of discrimination against Hispanics. Democrats (84%) are nearly twice as likely as Republicans (44%) to say Hispanics face a lot of discrimination today. When given possible explanations for the current socioeconomic disparities between white and black Americans, Americans are generally divided between explanations that highlight systemic, historical oppression and those that highlight personal responsibility and hard work. About half (49%) of Americans agree that generations of slavery and discrimination have created conditions that make it difficult for blacks to work their way out of the lower class. An equal number (49%) disagree with this idea. About six in ten (61%) Americans agree that white people have certain advantages because of the color of their skin, while 37% disagree with this sentiment. 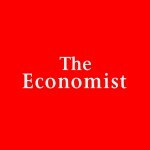 More than four in ten (42%) Americans believe that these socioeconomic disparities are really a matter of some people not trying hard enough—and that if blacks would only try harder, they could be just as well off as whites—while a majority (57%) say they disagree with this statement. These attitudes are highly correlated with one another and share similar demographic dividing lines. Using one of the questions as an example, there are clear racial and ethnic, educational, partisan, and age-based differences among Americans. White (45%) and Hispanic (43%) Americans are more likely than black Americans (24%) to agree that if blacks would only try harder, they could be just as well off as whites. Nearly three-quarters (74%) of black Americans disagree with this statement. Among whites, there are significant differences by gender and educational attainment. A majority (52%) of white men, compared to only 39% of white women, agree that blacks could gain economic equality with whites if they would just try harder. Whites without a four-year college degree (51%) are much more likely than whites who hold a degree (33%) to say that socioeconomic disparities exist because blacks are not trying hard enough. Republicans (72%) are much more likely than Democrats (23%) to agree that socioeconomic disparities between blacks and whites exist because blacks are just not trying hard enough. More than three-quarters (76%) of Democrats disagree with this statement. Seniors (47%) are more likely than young Americans (32%) to agree that blacks are worse off economically than whites because they are just not trying hard enough. By contrast, about two-thirds (66%) of young Americans disagree with this sentiment. Religious groups are divided along racial lines on this question. Majorities of white Christians, including 53% of white evangelical Protestants, 52% of white Catholics, and 51% of white mainline Protestants, agree that socioeconomic disparities between black and white Americans are due to lack of effort by black Americans. Strong majorities of non-white Christians (72%) and religiously unaffiliated Americans (70%) disagree with this sentiment. The survey was designed and conducted by PRRI. The survey was made possible by generous grants from The Carnegie Corporation of New York, The Nathan Cummings Foundation, Unitarian Universalist Veatch Program at Shelter Rock, and The New World Foundation. Interviews were conducted among a random sample of 2,509 adults (age 18 and up) living in the United States including all 50 states and the District of Columbia. Interviews were conducted both online using a self-administered design and by telephone using live interviewers. All interviews were conducted among participants in AmeriSpeak, a probability-based panel designed to be representative of the national U.S. adult population run by NORC at the University of Chicago. Panel participants without Internet access, which included 109 respondents, were interviewed via telephone by professional interviewers under the direction of NORC. Interviewing was conducted in both Spanish and English between September 17 and October 1, 2018. The weighting is accomplished in two separate stages. First, panel base weights are calculated for every household based on the probability of selection from the NORC National Frame, the sampling frame that is used to sample housing units for AmeriSpeak. Household level weights are then assigned to each eligible adult in every recruited household. In the second stage, sample demographics are balanced to match target population parameters for gender, age, education, race and Hispanic ethnicity, and division (U.S. Census definitions), housing type, and telephone usage. The telephone usage parameter came from an analysis of the National Health Interview Survey. All other weighting parameters are derived from an analysis of the U.S. Census Bureau’s Current Population Survey. The margin of error for the survey is +/- 2.8 percentage points at the 95% level of confidence. The design effect for the survey is 2.1. In addition to sampling error, surveys may also be subject to error or bias due to question wording, context and order effects. This analysis includes all Americans who identified a candidate preference. PRRI 2017 American Values Survey. In this section, “Republican” includes independents who lean towards the Republican party. PRRI/The Atlantic 2016 White Working Class Survey. PRRI/Brookings 2013 Religion, Values & Immigration Reform Survey.